Glue guns have a significant role in the world of crafts. It can be very helpful for making thousands of DIY projects and crafts. Hot glue guns use a continuous heating technology that melts the glue into liquid, which can be used on various materials like paper, woods, laces, and metals. But you need to select the right glue gun for your projects. So, if you are wondering how to select and use a hot glue gun, then you are at the right place. How To Select A Hot Glue Gun? There are two types of hot glue guns available: (a) The low-temperature glue gun that operates at 121 degree Celsius or 250 degrees Fahrenheit. (b) The high-temperaturee glue gun that operates at 193 degree Celsius or 380 degrees Fahrenheit. Low temperature glue gun is ideal for kids, it is also great for working on heat sensitive items like lace, clothes, and ribbons. Whereas high temperature glue gun is best for woods, papers, leather, and metals. In the competition between corded and cordless, cordless always sounds great. But cordless glue guns operate on batteries which can drain very quickly, so you have to replace them frequently. So, you can consider a model that offers both corded and cordless facility. When needed, you can detach the cord for working on the suitable project. If you are buying a corded glue gun, then select the model with a longer cord. If different tips can be used on a gun then, that is the best choice. You can control the flow of the glue by simply changing the tips. It provides more flexibility when you are working on different projects. So, choose a hot glue gun that comes with a removable or changeable tip. If you are choosing a hot glue gun for your project, make sure it has a stand. This offers safe storage of the gun when you are using it. It is quite handy when you are using the tool for a long period of time. It also avoids any damage to the tip of the gun. How To Use Hot Glue Gun? First, inspect whether or not the glue gun is completely fine and working. Then load the glue stick into the back of the gun. If it is corded, then plug the hot glue gun into a nearby electrical outlet. After plugging in, wait for some time while the glue gets heated up. It normally takes 4 to 5 minutes. Now, press the trigger of the gun lightly for releasing the melted glue on a piece of paper to test the texture. Once it is perfect, start doing your project. The melted glue will dry within few seconds. Never ever touch the hot metal tip of the gun when it is working as it can burn your finger. Don’t press the trigger too hard. Excess glue can come out of the nozzle and it can mess up the whole set. Start with a small amount of glue and squeeze more if you need. Make sure to keep your fingers away from the hot glue. Avoid pulling the gun too far from the surface. The glue can stretch and create a spider-web. Thus, selecting and using a hot glue gun is quite easy. 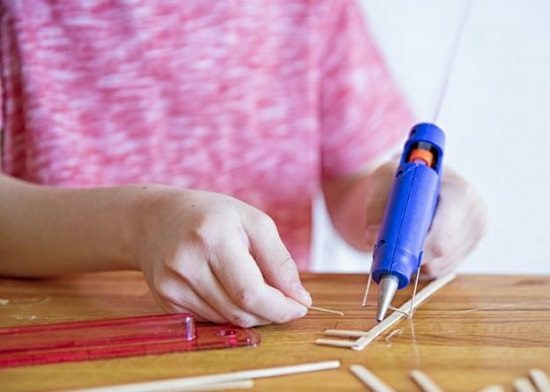 These hot glue guns can be quite handy for some crafts, DIY projects and small repairs. If you know the proper use of this glue gun, it can be quite helpful. Even due to the strong adhesive job, you can use this for small repairs of your house.